The scene of several million deaths at the hands of Spaniard invaders, Cerro Rico ("rich hill") is just above the city of Potosí in Bolivia. 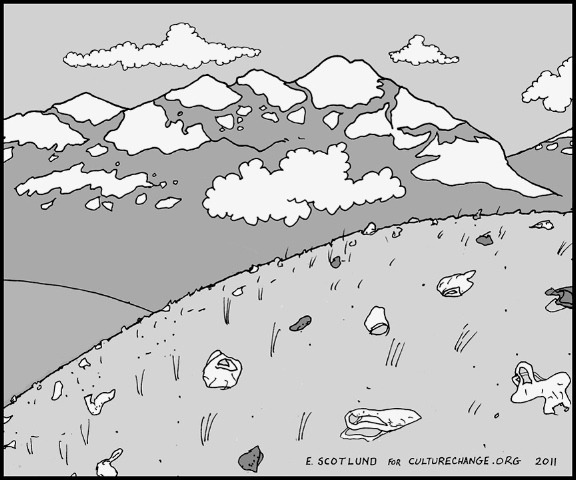 In May 2010, I noted significant amounts of plastic debris all over the mountainside, but I couldn't guess the source. The answer, from my local driver, is that the miners working in the mountain constantly use plastic bags for their daily coca supplies. Chewing the leaves provides stamina and curbs hunger. It is ironic that the seemingly harmless but unsightly plastic serves as a relatively new source of devastation to the health of the community and the ecosystem. For anyone to dismiss this concern as irrelevant compared to the poor miners' work conditions of yesterday and today is to let off the petroleum corporations and everyone down the line participating in a long-term tragedy affecting future generations. Learning about Cerro Rico, the conical, sinister looking mountain above the highest city in the world (at 13,500 feet) was made possible by my hiring a taxi driver at random. First I needed to get out to the fancy new bus station to buy a ticket to my next city, Cochabamba, for a night departure. No more "cama" (sleeper) buses were available, so I got "el normal" to sit up all night. After that errand we drove up to Cerro Rico for a tour. My driver, Celso Cruzamos, had worked in the mines for four years. He looked older than his 27 years. Toward the end of our three hours together -- a strain on my poor Spanish but otherwise a good experience -- Celso was asking me more questions than I was asking him. He was curious about costs in the U.S. and how I lived. One comment he made, without any input from me, is that the U.S. is "more controlled." he was right. 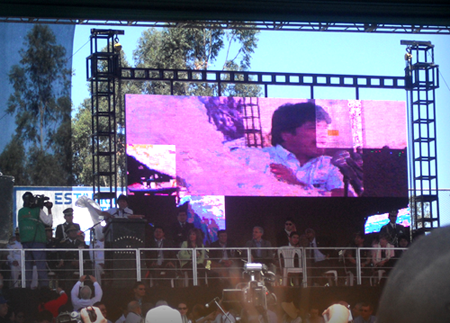 In Bolivia there is more flexibility and self responsibility. There's also more apparent chaos, such as with traffic. There are many police and soldiers about, but most have no guns and are there to help people by directing traffic, giving directions for a destination when asked, etc. Celso's father died at only age 35 when Celso was two years old. Occupation? Miner. Celso has tight shoulders years after quitting mining, but he cannot afford sports medicine. I suggested he get a friend to massage him. I reflected after my visit with Celso that the Bolivian people are on the whole more settled and sane than the U.S. population. 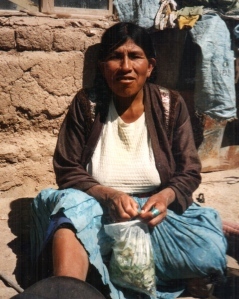 The two biggest reasons for this seem to be (1) close families for Bolivians (except, I would guess, for a few ragged looking beggars I've seen here), and (2) cultural roots going back many centuries in the same homeland. Celso's parents are/were mixed, Aymara and Quechua. There was no question of divorce, unlike the in the U.S. He has a wife and a four-year-old son who is not intended to work in the mines. 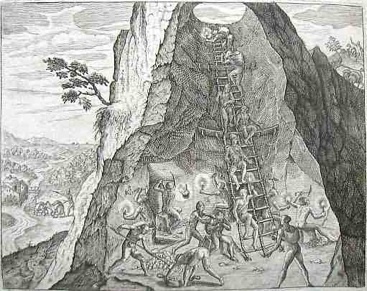 It is difficult to estimate how many Indians (natives) and African slaves were killed in the Cerro Rico silver mines and smelters. I saw figures as high as nine million. The Spaniards didn't care, and illness such as from mercury exposure can linger and add to uncertainty about death and longevity, thus clouding the numbers. The silver is mostly exhausted, but with other metals present the mining profession is still the main employer in the city of 200,000. A totally unseasonal rain downpour had left Cerro Rico and other Andes Mountains nearby dusted in snow for my viewing pleasure. I was okay at the altitude except for recurrent sleep apnea resulting from oxygen deprivation. After a lunch I set out to experience a part of the world I may never get to again. I did not go into the mines, a hazardous touristic exploit controlled by travel agencies. Having spelunked in safety in Gibraltar, I did not need the two hour trip inside the Cerro Rico itself. 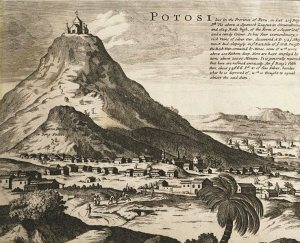 What many people don't realize is that the system or civilization that committed the genocide in and around Potosí is still dominant today. This is masked by the fact that, for example, the Spanish today are relatively harmless compared to the holy exploitation of the Americas starting in 1492 until the early 19th century. There is Spanish money supporting such efforts as the Zapatista-affiliated Earth University in San Cristobal, Chiapas, Mexico. But Spain is becoming desertified due to global warming, a consequence of Western Civilization. As in Chiapas, where "capitalist plastic" is burned at a Zapatista enclave I visited in 2008, the plastic contamination of Cerro Rico, Potosí and much of Bolivia is a plague on the land and waterways. The phenomenon is nothing less than a continuation of the same sick system of greed and disregard that the Spaniards engaged in: selfish gain and total disrespect for others' time-honored ways. My departure point with Celso up the mountain was Plaza Minero, a mineworkers' neighborhood in Potosí where I bought some bananas prior to our drive up the mountain. I doubt if many of the people I saw knew or dwelt on the connections of the past with the present regarding ongoing injustice -- from silver to petroleum that have impacted their lives in different ways. The effects of plastics and associated toxins are many, sometimes deadly, and barely understood. Not only is there unintended exposure of various kinds; parents putting plastic in the mouths of their babies can have serious effects on the endocrine system -- whether in the U.S. or Bolivia. Even if people start to become aware of this threat, they very seldom connect it with an overall system rife with oppression, exploitation and waste. Through divide-and-conquer, almost everyone is scurrying to get through life, just to the next meal or the next day. Revolutions have happened in history, but it is almost unprecedented that civilizations are overthrown. Rather, they collapse of their own accord. Past civilizations bit the dust with hardly any harm to the ecosystem or to future generations, compared to the present plastic-spewing, radiation-generating disastrous civilization of today. There's a continuum through to the present from the ancient Roman desertification of North Africa -- the former breadbasket of Rome -- thanks to short-sighted policies of that empire. Likewise, the Middle East and ancient Greece deforested and caused displacement of peoples looking to survive. The U.S., so I've heard, is deforesting at a faster rate than Brazil. Only 4% of the old growth is left in the U.S. -- a nation that is the pinnacle of Western Civilization, thus with a long way to fall. Unlike Bolivia and most other countries, the U.S.'s food is not locally produced for the consumer. The loss of social cohesion and community in the U.S. is alarming in its implications, as if today's suffering were not enough. This goes on as long as one can say "I just have to work." Placing money above the value of family is socially acceptable in the U.S., especially when individualistic isolation is so common and on the rise. Within the U.S. one cannot quite see the rampant materialism so obviously, until one leaves. Bolivia and other "underdeveloped countries" certainly have their problems, but such problems are not as marked in North America. The problems of the U.S. are more foreboding. Wars on distant, weaker countries are only one indication of failure and are a foretelling of collapse. The extreme petroleum dependence of North Americans is considered by many as a proud aspect of affluence, but it's really effluence. Bolivians all know that Pachamama, or Mother Earth, does not like pollution. Many Bolivians already know that plastic is a source of contamination, in part due to their President's comments at the April, 2010 Climate Conference (see Culture Change article below, first link.). Some Bolivians reacted to my saying that I have a bicycle instead of a car by saying "ecologista!" Cars are all too many in Bolivia, but are not so depended on compared to U.S. drivers' machines, due to the commuting and shopping in North America. When petrocollapse hits the world oil market, Bolvia will fare fairly well. Food is all local, and cities are that much more walkable in Bolivia when the people are genetically developed to regularly climb mountains. Again, it is the closer community of all Bolivians that will help them pull through, although there will be casualties from the melting trend affecting key glaciers depended on for water supply. Bolivians are a polite people, friendly but a bit reserved. And they are tough -- is there any other people that can hold their urine better on all-night buses that don't have a wc or ever stop? I'm doing my best on this bus ride to hold my own, and I am hopeful for the Bolivian people to pull through the intense global changes ahead. It may be not too difficult because they can always start getting closer to their indigenous roots. I like this story, it tells of the strength of Latin people, like my own family. Not one of those "the end is near" presentations I've seen ever comes close to identifying the need to yes, dispose of our dollar predominant lifestyles, and create local monetary systems that are based in service to the local community, i.e. bartering and systems like TimeBank, Ithaca Hours, etc. You are spot on in your article- it will be the goodwill connections between people that will matter most as present world systems collapse, not the pursuit of "happiness" via hyper-consumerism. The real questions will be - who can produce food, who can teach people in the local community how to self-heal, will there be centers for children/seniors so that parents can work to build a New Dream while seniors have a meaningful place in our world caring for and imparting wisdom to our young? This list of questions is only the beginning of the countless many things we must consider as we strive to create a new world out of the present world's ashes. You're on a beautiful wavelength, as you have been since I've known you. What our discussion here is about is that there is a better way to be and coexist, although it means going without personal riches -- opting instead for tribal wealth, or however you want to call it. Incidentally, a cartoon or drawing by our E Scotlund for the article is forthcoming.